*Uflex launches Low Opacity, Good Gloss White, Anti-Static Twist Wrap Polyester Film*Candy and confectionery are high impulse buying items, therefore, the importance of aesthetical packaging thereof cannot be emphasized enough. 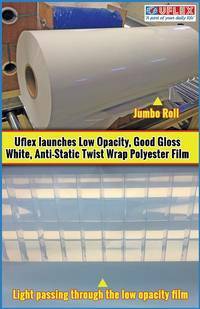 With this problem statement at hand the Films Business of India’s largest multinational flexible packaging materials and Solutions Company Uflex Limited has engineered Low Opacity, Good Gloss White Anti-static Twist Wrap Polyester Film *FLEXPET^TM F-WTG-AS. *This bi-axially oriented polyethylene terephthalate (BOPET) Film as the name suggests is low opaque/ translucent and has good gloss.